Rediff.com » News » After the tragedy: We don't need politics please! After the tragedy: We don't need politics please! 'There is no difference morally between politicians scoring points amid the rubble and non-politicians who assume that politics and corruption necessarily had something to do with it,' says Mihir S Sharma. 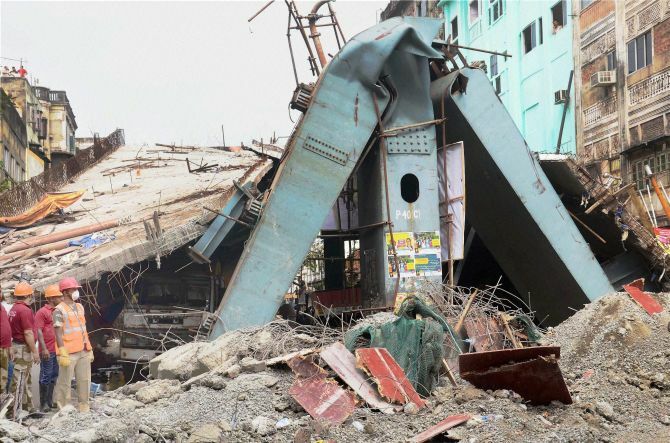 Sadly, given it has happened just as the West Bengal assembly campaign reaches fever pitch, the collapse of the under-construction flyover near Kolkata's Ganesh Talkies crossing will become something for the state's main parties to hit each other with. This is a pity, and not just because politicking in the midst of a tragedy is always sordid. It's also because it's vitally important to calmly figure out what might have gone wrong in the project without making convenient assumptions before the facts are in. The Left Front and the (Gandhi) Congress, challenging the long dominance of Mamata Banerjee's Trinamool Congress in Kolkata, have pointed to a statement by the chief minister last year in which she tried to set an early deadline for the completion of the elevated road project, which had already missed eight -- or possibly nine -- deadlines. The TMC responded by arguing that the contractor chosen for the flyover, the Hyderabad-based IVRCL, had in fact been awarded the job in February 2009, under the Left Front government. IVRCL has since become one of the poster children of India's stressed infrastructure industry, blacklisted by various operators including the Indian Railways; so the Left has asked why Banerjee's government didn't change the contractor when IVRCL started to run out of money. And it has correctly pointed out that IVRCL won the tender by being the lowest bidder, in a transparent and open auction process. These are all pertinent questions, and the police need to investigate any credible accusations of negligence against IVRCL. But there are signs that the election-time debate will ensure that the follow-up to this calamity will become nothing more than political point-scoring and scapegoat-hunting. It has been reported, for example, that criminal charges against IVRCL are to be upgraded from culpable homicide to actual murder — something which, given that very little evidence has as yet been brought to light, sounds like political intervention in the process. But the possibility remains that IVRCL will not be found to have done anything notably wrong; they may well have followed every protocol, if barely, and it may be impossible to show actual legal wrongdoing, just cut corners. What happens then? Are there still no lessons to learn? There are indeed. But they aren't comfortable lessons for those of us accustomed to thinking purely in terms of venality and corruption as India's number-one problem. The questions are these: For a project as complex as this, a 2.2-kilometre elevated road through a congested area, with multiple turns and branches, is awarding the tender to the lowest bidder really the best thing to do? Are the qualifications required of any company for entering the bidding process too easy? But if such qualifications are made harder depending on the difficulty of the project, does not that allow for the sort of discretion that opens the door to political corruption? When it comes to safety and competence, should there not in fact be place for discretion? If the state government had indeed wanted to replace the contractor, would not the anti-corruption crusaders have asked if money changed hands? There is no difference morally, to my mind, between politicians scoring points amid the rubble and non-politicians who assume that politics and corruption necessarily had something to do with it. Both are twisting a tragedy to their own ends. Scapegoating -- of another party, of the contractor, or of politicians in general -- is exactly the wrong response. It means you search for someone to pillory, rather than ways to fix the problems that were so tragically revealed. But the worst response would be to declare that this is necessarily a failure of town planning -- the preferred reaction of the 'who-needs-flyovers-anyway' school of thought. The elevated road project -- partly funded by the Centre under the Jawaharlal Nehru National Urban Renewal Mission -- is a vital part of the longer-term project to decongest and revive north-central Kolkata. This area, the historical heart of the urban Bengali, the home of fabulous buildings and bustling ethnic enclaves, does not deserve to be cut off by traffic and poor connectivity from the rest of the city. Indeed, Kolkata's infrastructure-building programme, under both the TMC and Left governments, in fact deserves praise. No metropolitan city in this country, bar Delhi, has done so much so quickly for infrastructure in the past decade. Not all the interventions have worked, as locals will tell you, but the fact remains that the city is no longer the place I grew up in, where the Metro dig was a fixture, moving incredibly slowly up along Chowringhee. Today, work progresses on five of seven planned Metro alignments relatively swiftly; the Japan-financed east-west Metro corridor should be done by the middle of 2018. Unlike Delhi's Metro, which criminally ignores interchanges with other railway projects and multi-modal transport in general, the different companies running various stretches, have nevertheless agreed on interchanges and a hub at Esplanade. Bengaluru and Mumbai -- the latter home to the only Metro in the world where it rains inside the compartments -- can't quite hold a candle to this big build-out. And it's one that is finally gathering pace, promising to make Kolkata the country's most liveable and vibrant city. The worst thing that the politics could to in response to this tragedy is to stop the process altogether.